Stirling’s young people have led in the development of a digital prototype that aims to tackle the stigma around adolescent mental health. In the first-ever citizen sourced challenge* by CivTech – the Scottish Government programme which invites tech companies to solve public sector challenges – they worked closely with Edinburgh-based company, Voxsio, to address this serious issue using conversational Artificial Intelligence technology. Mental health champions in Stirling’s secondary schools and members of the Stirling Youth Forum were among those involved in the pioneering project, which started seven months ago. And today (Feb. 6) they unveiled their prototype – a Chatbot called ‘Alli-Chat’ that will be accessible across social media platforms – to delegates at CivTech’s Demo Day at the International Conference Centre in Edinburgh. Designed to help start the conversation about mental health among the younger age-group, Alli-Chat will also offer personalised advice on where to access additional services and ongoing support. 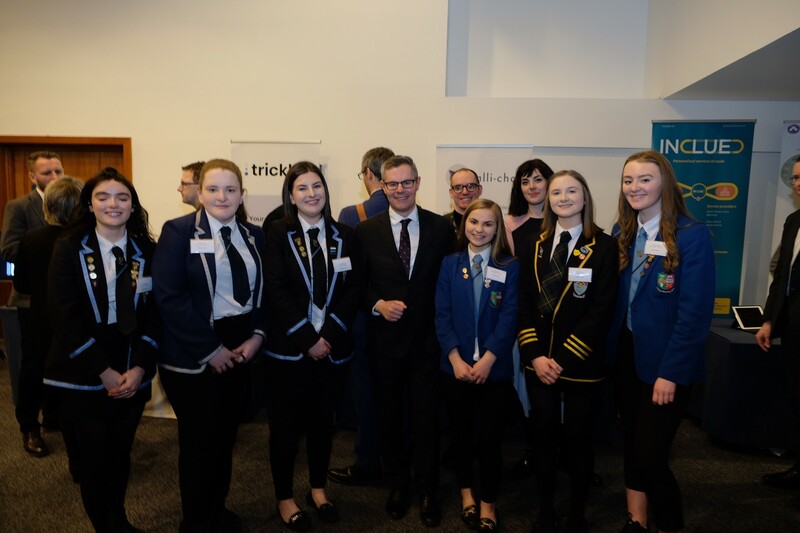 Scottish Government Finance Secretary, Derek Mackay, and Sandy Kennedy, CEO of Entrepreneurial Scotland, were the keynote speakers at the event, which attracted attendees from the public, private and third sectors. Stirling’s young participants on the project were named as Youth Leaders given their equal status on the challenge team, working alongside Voxsio and co-sponsors* Stirling Council, NHS National Services Scotland and Health Care Improvement Scotland. They led in every step of the process including the procurement stage, developing the solution in the accelerator* phase and reviewing and signing off payments for the company at agreed milestones. Stirling High S5 pupil Sarah Purser, speaking on behalf of the Stirling Youth Leaders, said: “Mental health is a key issue for young people across Scotland, and we wanted to develop a digital solution that addressed the stigma of accessing mental health and also start a conversation around this important subject. “Seeing the Chatbot in action for the first time was really exciting and it was more impressive than we could have imagined. “By being available across social media platforms, this innovative technology will be accessible for our generation, whether they need personalised help or are supporting others. CEO of Voxsio, Michael McTernan, said: “At Voxsio, it is our mission to create conversations with young people that give them the tools and knowledge to manage their mental well-being. Stirling’s young people highlighted mental health as a pressing issue for their age-group as part of the ‘Our Place, Our Space’ initiative, which gives their generation a voice in influencing services. Councillor Susan McGill, Convener of Stirling Council’s Children and Young People Committee said: “We are really proud of our young people for the leading role they have played at every stage of this pioneering project, which aims to make the lives of their peers better. Councillor Margaret Brisley, Vice Convener of Stirling Council’s Children and Young People Committee said: “We are placing young people at the heart of decision making through Stirling’s ‘Our Place, Our Space’ project, the Stirling Youth Forum and our school mental health champions. * CivTech Challenge is a problem a public sector organisation would like solved or developed, so that it can go out to the market in an open challenge format. * Challenge Sponsors fund teams, provide knowledge, experience and insight, along with time commitment to the project. * A tech accelerator is a widespread way for tech start-ups to develop their product as fast and effectively as possible.